Any recipe with red velvet in the title is usually a sure-fire winner. 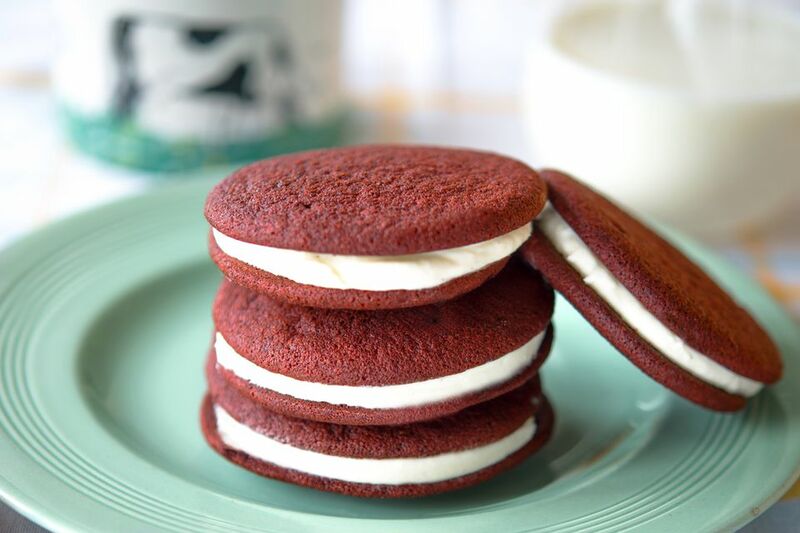 These red velvet sandwich cookies with their sweet vanilla buttercream are no exception. They are delicious and super-easy to make. They do not keep long without freezing, but they are so tempting to eat, that will not be a problem. Gather your ingredients. Preheat the oven to 360 F. Line 2 to 3 baking trays with baking paper lightly greased with a little butter or silicone mats. Cream the butter and sugar together using a stand or electric hand mixer. You can also beat with a wooden spoon by hand. Cream until the butter and sugar are pale, light and fluffy. Add the egg and beat again. Finally, beat in the vanilla extract and buttermilk or sour cream to create a smooth batter. In a separate bowl, sift together the cocoa, flour, baking powder, and baking soda. Carefully tip the dry ingredients into the batter and slowly beat together. Add the red food gel and mix again adding more gel for extra color as you wish. Spoon batter onto the baking sheets by the tablespoon at least 1 1/2 inches apart. Bake in the center of the preheated oven for 8 minutes until slightly risen and firm, but not hard to the touch. Remove from the oven and leave to cool on the baking sheets for 5 minutes, then remove and place on cooling racks until completely cold. Make the Buttercream; beat the butter, sugar and vanilla extract together in a stand, or hand mixer until light and fluffy. Put into the refrigerator until needed. Once the cookies are completely cold, take the buttercream from the fridge and leave to warm slightly if too hard to spoon easily. Scoop up a generous tablespoonful and place in the center of the cookie. Place another cookie on top, flat-side down, and twist while pressing down gently; the cream will spread evenly reaching to the rim. Continue with the remaining cookies. The cookies are best eaten within 24 hours but will keep for a day or two if stored in an airtight box somewhere cool. The cookies freeze well but do this before adding the filling and fill when you are ready to serve them. Food coloring gels deliver a bolder color using far less than a traditional liquid food coloring. If you cannot find gel, then use at least 1 teaspoon of liquid, and more if you prefer a stronger color. These red velvet cookies have a sweet vanilla buttercream which works so well with the chocolate flavor of the cookie. You can, however, work any magic you like to ring the changes by switching out the flavors. Add a tablespoon of cocoa powder to the buttercream, a few drops of rose water, or even your favorite liquor. If buttercream is too sweet for your taste, try whipping up light cream cheese and a drop of vanilla, delicious.